Смотрите выкуп бу шин на нашем сайте. http://автозаим.рф взять кредит под залог без дохода банков для кредита под залог. 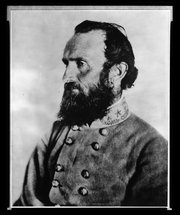 Thomas Jonathan "Stonewall" Jackson (January 21, 1824 - May 10, 1863) was an American teacher and soldier. He became a famous Confederate general during the American Civil War, and was killed midway through the conflict. Jackson is often considered one of the most gifted battlefield commanders in American history, and his death was a severe setback for the Confederacy. Thomas Jonathan Jackson was a great-grandson of John Jackson (c. 1715 - September 25, 1801) and his wife Elizabeth Cummins. John was born in Coleraine, County Londonderry, Kingdom of Ireland. He emigrated to the Province of Maryland in 1748 and moved to the Colony and Dominion of Virginia in 1758. He participated in the American Revolutionary War, notably fighting in the Battle of Kings Mountain (October 7, 1780). He was a lieutenant of the Virginia Militia since 1787. Elizabeth was born in London and raised by an unwed aunt. She was the only heir of said aunt and inherited one thousand pounds sterling. She emigrated to Maryland on her own and later used her inheritance to acquire 3,000 acres of land. She is said to have successfully defended her land from attacks by Indians. They were parents of eight children. Their second son Edward Jackson (March 1, 1759 - December 25, 1828) was married twice. He and his first wife Mary Haddan were parents to six children. He and his second wife Elizabeth Weatherholt Brake were parents to an additional nine children. Jonathan Jackson was his third son by his first marriage. Jackson was the third child of Julia Beckwith (née Neale) Jackson (1789 - 1831) and Jonathan Jackson (1790 - 1826), an attorney. Both of Jackson's parents were natives of Virginia. The family already had two young children and were living in Clarksburg, in what is now West Virginia, when Thomas, their third son, was born. U.S. Army, the Mexican War.